Many of the folks who visit porthopeknights.ca are Moms and Dads with little guys and gals who are bubbling with anticipation and excitement on this Christmas Eve. So, I thought I’d share a tech toy which I think is an excellent addition to the festive season. Each Christmas Eve for the past 50 years, NORAD, the bi-national organization responsible for the aerospace and maritime defense of the U.S. and Canada, accepts an additional mission: to track Santa’s flight around the world. In 1998, Santa Tracking on the internet went live with video feeds from digital cameras pre-positioned around the world. 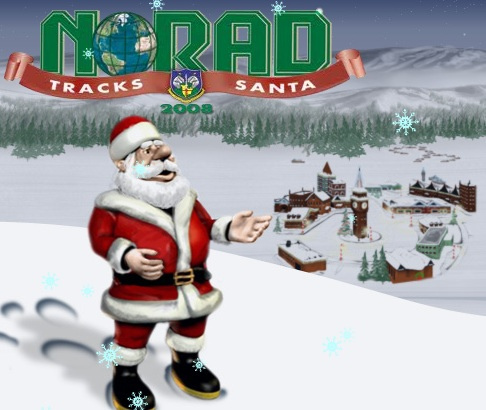 From early in the day on Christmas Eve, if you go to NORAD Tracks Santa, you can watch Santa’s progress around the world. See the famous sleigh zoom over the Sydney Opera House, weave around the Eiffel Tower and zip past Buckingham Palace. You can also call or email NORAD volunteers who will answer questions on Santa’s exact location. The games and information on the website will help with your children’s pre-event jitters. My personal favorite? The Santa Tracker FAQ, especially the “Sleigh Technical Data”. It’s a hoot!